produced on a human being. 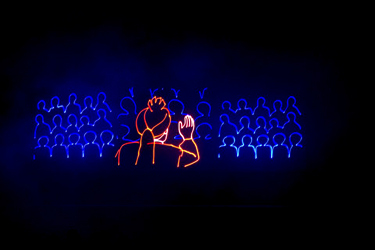 The unique show attracted an estimated 1500 people at the audience. A historic day at the Ramakrishna Mission Delhi, where “Swamiji” was shown on the massive stage, custom-built at the green lawn of the Ashrama. An estimated 1500 people attended the show and they were everywhere, spilling well-beyond the sitting areas on formally covered lawn chairs. They were wherever they could find a spot to stand or sit including the sidewalks, lobbies of the surrounding buildings, steps of the large temple, gardens, and even at the balconies of the hotel at the far end, beyond the property line of the Ashrama. 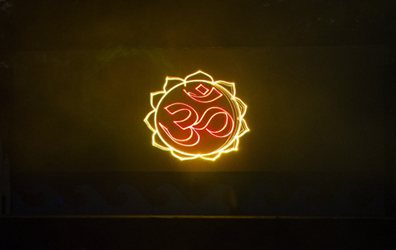 At 6 pm, the program started with Vedic Mantras chanted by the monastics and a prayer to Swami Vivekananda. It was then followed by a speech by Swami Shantatmananda, Secretary, RKM Delhi, and Shri Ramakant Goswami, Minister of Transport, Delhi. 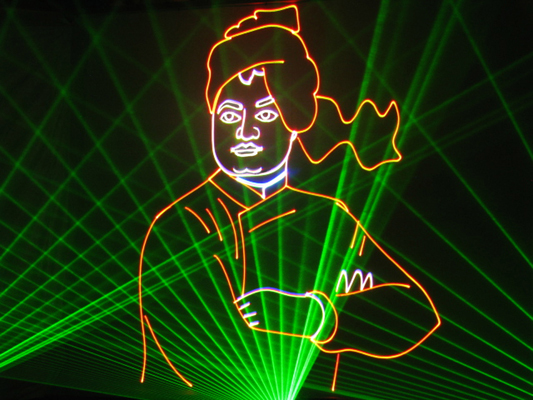 “We organized a Laser Show on Swami Vivekananda titled ‘Swamiji’ as part of the 150th Birth Anniversary Celebrations of Swami Vivekananda on Sunday, the 9th of December, 2012. It is a production of Shri Manick Sorcar, USA, son of the legendary magician Shri P. C. Sorcar. 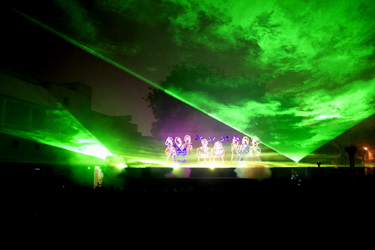 The show, which was held in the lawns of our Ashrama in an outdoor stage specially erected for the purpose, attracted nearly 1500 people. It was deeply appreciated by one and all. The show is truly praiseworthy. In a short time of about one and a half hours Shri Manick Sorcar has been able to trace Swami Vivekananda’s life-journey from his birth to Mahasamadhi. The events, narration, etc. are extremely authentic, accurate and appropriate. It gives in a nutshell both Swami Vivekananda’s message to the West as well as to the East and highlights Swami Vivekananda’s contribution for religious harmony. We specially recommend this show for our centres in the West particularly in the context of Swami Vivekananda’s 150th Birth Anniversary. It depicts very powerfully Swamiji’s work in the USA giving glimpses of his soul-stirring messages. The show will be very appealing to the Western audience”. After the show, Swami Shantatmananda came on the stage to congratulate Manick and the group for the “captivating” show and felicitated him, his wife Shikha and the group with gifts and a heart full of thanks. There was frenzy when the Sorcars and their team came down to meet with people at the audience. The monastics gave their blessings “for doing an outstanding job in portraying the authentic history of Swami Vivekananda”, and people of all ages conveyed their feelings in their own words which can be summarized by the words of one elderly lady who gave her blessings with moist eyes “God bless you son for sharing this remarkable documentary, we were touched”. More scenes from the show. 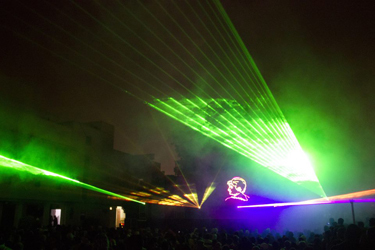 "Apart from the very impressive display of laser technique, what really gladdened our hearts was the accuracy, authenticity and appropriate nature of choice of incidents, music narration, etc." , wrote Swami Shantatmananda, Secretary, RKM, Delhi. 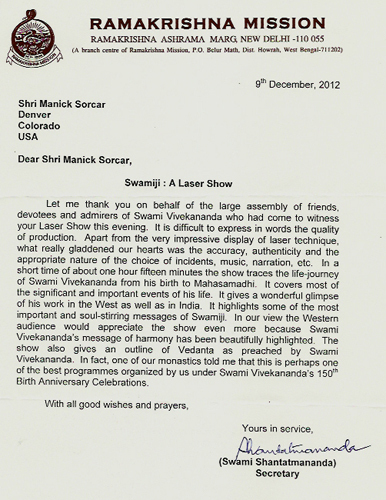 “Let me thank you on behalf of the large assembly of friends, devotees and admirers of Swami Vivekananda who had come to witness your Laser Show this evening. It is difficult to express in words the quality of production. 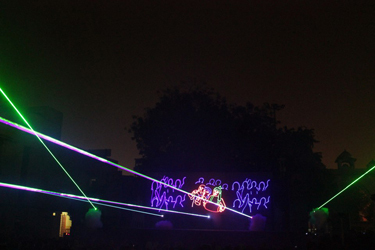 Apart from the very impressive display of laser technique, what really gladdened our hearts was the accuracy, authenticity and the appropriate nature of the choice of incidents, music, narration, etc. In a short time of about one hour fifteen minutes the show traces the life-journey of Swami Vivekananda from his birth to Mahasamadhi. It covers most of the significant and important events of his life. It gives a wonderful glimpse of his work in the West as well as in India. It highlights some of the most important and soul-stirring messages of Swamiji. In our view the Western audience would appreciate the show even more because Swami Vivekananda’s message of harmony has been beautifully highlighted. 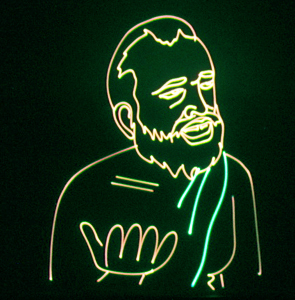 The show also gives an outline of Vedanta as preached by Swami Vivekananda. In fact, one of our monastics told me that this is perhaps one of the best programmes organized by us under Swami Vivekananda’s 150th Birth Anniversary Celebrations". 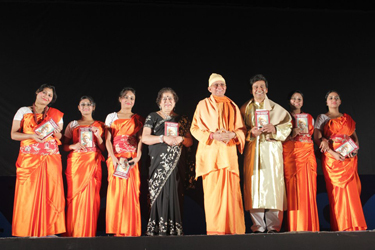 (Left) A scene from the show (Right) Manick Sorcar, his wife Shikha (in black Sari), and the group were felicitated on stage after the show by Swami Shantatmananda, Secretary, Ramakrishna Mission Delhi. Ramakrishna Mission New Delhi: Photos and videos don't do enough justice to the excellence of the program produced by Sri Sorcar! Many more centres of the Ramakrishna Mission want to have the same program. So do not miss it if you get a chance. Namaskar. Avik Choudhury: Can we have the online video of the movie.... plzz!!! Ramakrishna Mission New Delhi: Avikji, we will try to upload a few minutes of the program...it has to be seen live to enjoy the grandeur! Namaste. Raman Nanda: It was good to have been there! Sumit Gosain: Namaste Guruji..kal Program ko dekh kar mann ki bhavnaye foot-foot kar umad rahin thi..Ye basha banavati nahin hai..sach mein mera sharir kaanp raha tha..
Ramakrishna Mission New Delhi: Thanks all for the comments. So many moist eyes in the audience... Namaskars. Anila Gupta: Yesterday's program was not just brilliant, it was like Swamiji himself- brilliant, compassionate, passionate and utterly captivating. Thank you for giving us this chance to share in this. Swamiji Maharaj ji ki jai.